Exbury WW2 New Forest. Why was it put into military service? Why and how was it used for wartime military service? Exbury during WW2 in the New Forest played a key military role during WW2 and the wartime effort of the allies. Today the peaceful gardens, beautiful house and little railway have a tranquil feel as you wander round the grounds enjoying their beauty. During World War Two it was a very different place indeed. This beautiful Rothschild family estate was used by Naval Intelligence during World War Two. How and why was the Exbury WW2 New Forest change achieved? Over 1000 Nissen huts housed the personnel who were collecting vital intelligence data and at nearby Inchmery House, Free French and Polish commandoes were involved in intelligence training. 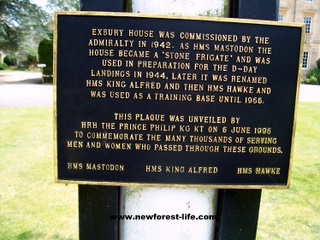 During World War Two, Exbury was renamed Her Majesty's Stone frigate "Mastodon". Mr de Rothschild was given 48hours to clear the house in readiness for the Intelligence Servcie occupation - not an easy task I'd imagine. The Beaulieu river runs at the bottom of the garden and landing craft were regularly tested here ready for the D day landings - apparently there is still a small navel craft in the mud today. Now you can add your own personal WW2 stories and memories to share with others here. When you have finished reading all you have to do is fill in the form at the bottom of the page. This Rothschild estate was given an exemption, unlike the rest of the New Forest. No tanks or guns should be parked in the gardens as it was felt they would ruin many rare and beautiful plants - a good bit of forwarding planning. As I 've previously mentioned the Mulberry Harbour was constructed on the Beaulieu river at Bucklers Hard. 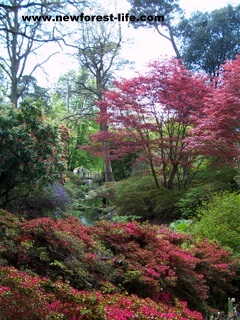 However, the planning took place at Exbury near the Captains Cottage under a mulberry tree - hence the name! After the D day landings in early 1945 the House became HMS King Alfred and later HMS Hawk. It was a very strategic property because of the access it had to the marshes. At this time and up until 1955 Montgomery was concerned that the Russians and the Cold War posed a threat to Britain. Exbury WW2 New Forest plaque commemorating all those who fell during the landings or passed through Exbury during this time. 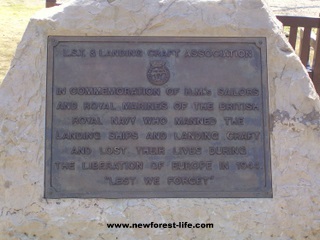 There is a commemorative plaque for all those who fell during the landings and also those who passed through Exbury during World War Two and subsequently died. The Exbury Veterans Association have also provided a bench so that people can sit and see the flagpole - have a look if you visit - you may need a quiet sit down too! Would you like to find out more history of Exbury? Welcome to New Forest Life SiteSearch. I really hope you find this Google tool helpful in finding your way around my site. Are you wondering where you saw the World War Two special agents page? Perhaps you found some information, or a really lovely photo of a New Forest pony, and wanted to find it again? New Forest Life SiteSearch has the answer. For example: put World War two special agents if you are looking to find information on the World War two spies and hit the Search button. Has Exbury WW2 New Forest triggered a memory from your own or your family archives you'd like to share with us? Here's where you can add them. Just fill in the form below and share your story with us all. Do you have a great WW2 memory you can share? WW2 memories are heartfelt, poignant and very personal. Some of them can be funny - have you got one to share?